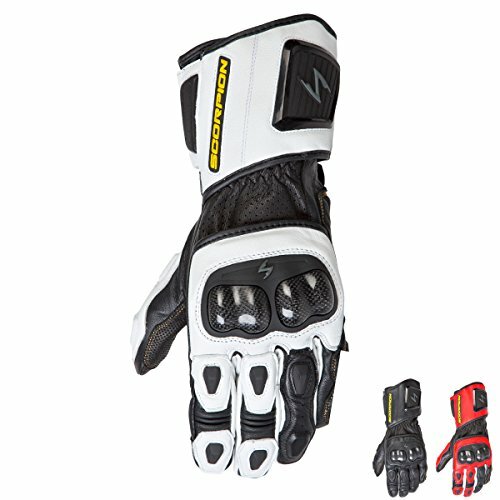 The SG3 MKII is a long gauntlet leather sport bike glove that has great dexterity and serious protection. The premium goat leather is supple, yet offers a lot of protection against abrasions. The carbon fiber reinforced hard knuckles protect the back of the hand, while the KNOX SPS palm sliders allow the hands to slide along pavement instead of catching and sending you tumbling. TPU armor on the fingers and wrist, as well as extra leather overlays and padding along the fingers, palm, and pinky offer additional protection. KwikTouch areas on the index finger allows you to operate touch screen devices without taking your gloves off.